How A Spanish City Went Boom, Then Bust Valencia, which once spent lavishly on tourism projects, now epitomizes the worst of Spain's economic problems. Its landscape is littered with empty and half-finished buildings, and the regional government has run out of funds to repair schools. 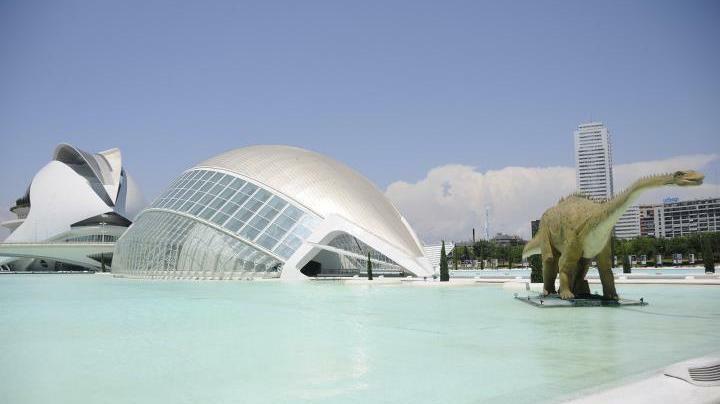 Valencia spent more than $1.5 billion to build the City of Arts and Sciences, the museum complex shown here in a photo from summer 2011. The Spanish region of Valencia has been called the "California of Spain" for its gorgeous Mediterranean coastline and modern architecture. But now Valencia epitomizes the worst of Spain's problems. It had the country's most inflated property market and the biggest crash. Its landscape is littered with empty and half-finished buildings. Valencia has also had an unusually high number of politicians indicted for corruption. In 2007, Valencia spent $730 million on a Formula One street circuit that hugs its Mediterranean shores. Two years later, Valencia's regional president, Francisco Camps, did a victory lap in a $200,000 Ferrari. He'd just hosted the European Grand Prix and the America's Cup yacht race. Construction was booming. But that infamous Ferrari ride was the beginning of the end. Camps has resigned from office to defend himself full time against corruption allegations. Thirteen others await trial. And Valencia is now Spain's most indebted province. 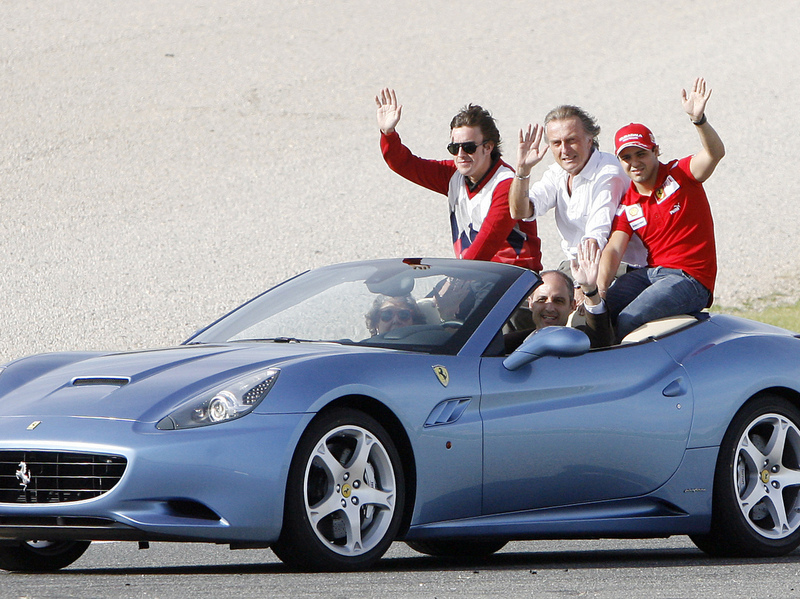 In 2009, Formula One driver Fernando Alonso (from left), Ferrari President Luca Cordero di Montezemolo and Ferrari F1 driver Felipe Massa ride in a Ferrari driven by Valencia's then-regional government president Francisco Camps. "Probably we are the main example of every single sin that has been committed in the Spanish economy for ... maybe the last 15 years," says Vicente Pallardó, an economist who raised alarms before the crash. He says cheap credit, and European Union development funds, let Valencia build infrastructure too quickly. The region now has more miles of high-speed train tracks per capita than anywhere else in the world. When U.S. Transportation Secretary Ray LaHood visited in 2009, he was "very surprised," Pallardó recalls. "He said, 'Wow, you are very rich! We are not able to spend so much money building.' But come on, it's the U.S. So, we are not richer. Our per capita income is about 60 percent of that of the U.S.," Pallardó says. To understand why Valencia's politicians acted like they were so rich, you have to go back to the 1980s, when this region was relatively poor. Economist Elias Amor worked for Valencia's government back then. "We hadn't a highway to Madrid until 1996 or 1997. There was a road, a terrible road," he says. "The investments of the central government in Valencia were very low — were the lowest in Spain." So when cheap credit started flowing, politicians set out to right past wrongs, and put Valencia on the map. A 2008 tourism ad declared: "Valencia's goal is to become one of the most important urban tourism destinations in Europe." And that goal was achieved. The biggest landmark is the City of Arts and Sciences — a complex of museums that cost more than $1.5 billion to build. Amor says locals are proud. "I remember my father — my father died in 2004 — and he came every morning here to observe the construction of the City of Arts and Sciences," Amor recalls. "And when we met him in the evening, he used to tell me that this was the most important thing that was done here in Valencia since the time of the Miguelete." The Miguelete is a medieval church in Valencia's center. The city hadn't seen a building boom like this since the Middle Ages. But Valencia's citizens will be paying for it for years. Miguel Angel Ferris Gil, a former journalist, runs alternative tours of Valencia — to show citizens just what they've paid for. At the Formula One track, he says the regional president's iconic Ferrari ride was a symbol of all the luxury and political corruption. "They were enjoying his power in Valencia, their impunity with the media and other things," he says. An abandoned tramway leads to the fenced-off racetrack. There are no trains. "It finishes here. It doesn't ... arrive [at] the neighborhood," he says. "It's finished. It's all like that." There's no money to complete the project, he says. Valencia still hosts Formula One races. But the regional government has run out of funds to repair schools, and some kids have been attending class in trailers for years. Politicians are thinking twice about Ferrari photos these days.